From Tamashii Nations. 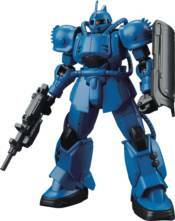 Ramba Ral's prototype mobile suit seen in the fourth episode of Gundam The Origin is recreated for this HG Model Kit! Ral's custom MS-04 Bugu from Mobile Suit Gundam: The Origin snaps together easily without glue and comes with its shield and weapon! The 1/144-scale model stands approximately 5' tall when complete.